President’s abuse of authority strips protections from iconic dinosaur wonderland in Utah and undermines 1906 Antiquities Act. Washington, DC — Hours after President Donald Trump issued a proclamation taking an axe to Grand Staircase-Escalante National Monument in Utah, conservation organizations filed a lawsuit attacking the order as an abuse of the president’s power. The Grand Staircase-Escalante contains dinosaur fossils found nowhere else in the world. Since its designation, 21 new dinosaur species have been unearthed by scientists in the monument, leading some to call these lands a “Dinosaur Shangri-la,” and a “geologic wonderland.” Grand Staircase holds one of the richest collections of fossils from the Late Cretaceous Period, which gives scientists and the public alike an unparalleled window into the dinosaurs that lived in these lands 10 million years ago. In mid-October, scientists airlifted one of the most complete tyrannosaur skeletons ever found out of Grand Staircase. These fossils are largely found in the Kaiparowits Plateau, where the coal industry has long coveted access for coal mining that would wreak havoc on this dinosaur treasure trove that belongs to the American people. President Trump’s executive order to revoke and replace Grand Staircase-Escalante National Monument came on the heels of a review conducted by Interior Secretary Ryan Zinke. Over 2.7 million Americans roared their support for national monuments across the country, and public participation in the comment period was overwhelmingly in favor of keeping these public lands and waters protected just as they are. "President Trump is attempting an unauthorized remodel of the Grand Staircase, knocking out not only geologic steps but cornerstones of the evolution of species, human history, and our cultural heritage as well,” said Tim Peterson, Utah Wildlands Program Director with the Grand Canyon Trust. “We've spent 20 years working to preserve Grand Staircase, and now we're asking the courts to help us reconstruct what was torn down today." President Bill Clinton protected the lands of Grand Staircase as a national monument on September 18, 1996 using the Antiquities Act, a century-old law that has been used by 16 presidents since Theodore Roosevelt to protect some of our nation’s most cherished landscapes and cultural heritage. Congress enacted the law in 1906, granting presidents the authority to create national monuments on federal lands to protect significant natural, cultural, historic or scientific features. The Antiquities Act does not, however, grant presidents the authority to diminish or rescind the monument designations of their predecessors. 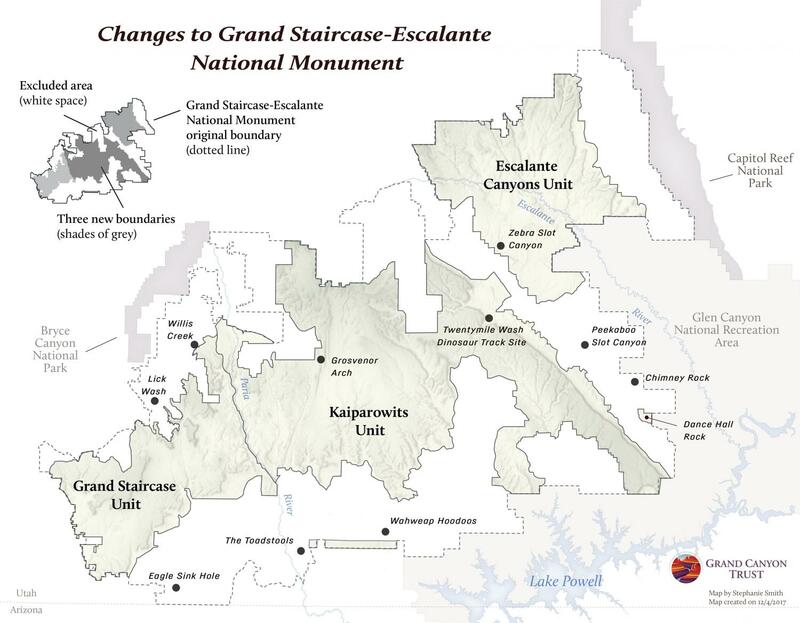 “If the Trump administration thinks Grand Staircase-Escalante can be sold out without a fight, they’re in for a huge surprise,” said Jamie Rappaport Clark, president and CEO of Defenders of Wildlife. “We’ll be seeing them in court." "The Trump administration has ignored overwhelming support for the monument. It's a punch in the face to local businesses who support it, and all of us who treasure it," said Shelley Silbert, Executive Director of Great Old Broads for Wilderness. "Our organization got its start in the Escalante Canyons nearly three decades ago and we've worked tirelessly for proper management of the national monument since its designation. We will fight this illegal action to take any portion of this monument away from the American people." After President Clinton designated Grand Staircase, an intricate land swap between the state and federal government was completed. 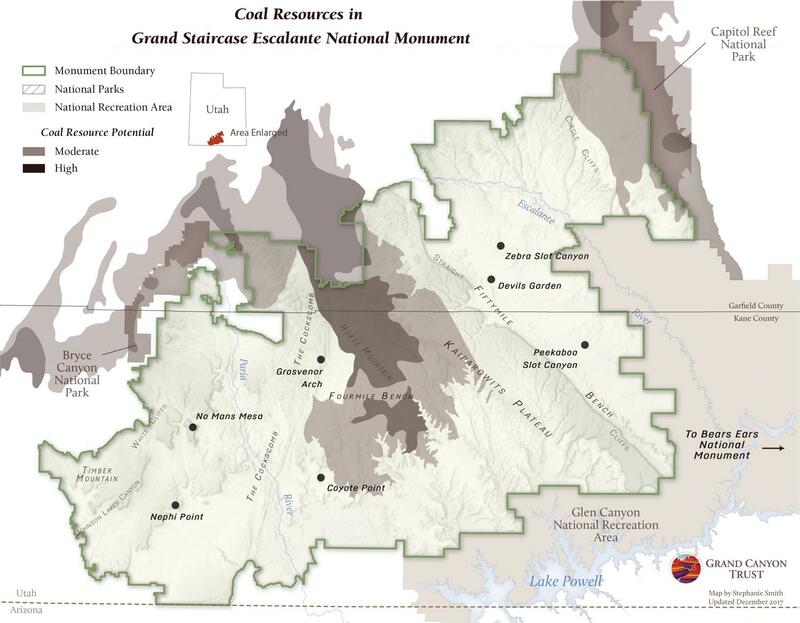 Congress passed legislation modifying the monument’s boundaries in 1998 and then approved a land swap in which the state of Utah received 145,000 acres of mineral-rich federal lands and $50 million from the federal treasury. That $50 million has since gone to support Utah’s public schools, and the swap would be incredibly difficult to unravel. The Utah School and Institutional Trust Lands Administration established the Land Exchange Distribution Account to dole out the proceeds from these state-federal trades. At least 27 Utah counties have since received a total of $441 million. Grand Staircase-Escalante has proven a tourism and economic boon for Southern Utah since its designation. Between 2001 and 2015, the population in the two counties bordering Grand Staircase grew by 13 percent, jobs increased 24 percent and real personal income grew 32 percent. Travel and tourism boomed in the region, offering 1,630 jobs around Grand Staircase. In the big picture, recreation from adventure-seekers, hikers, amateur geologists and families simply getting outdoors now funnels more than $12 billion into Utah’s economy. Read the legal document for our lawsuit filed with the United States District Court in Washington, D.C. When President Theodore Roosevelt signed the Antiquities Act into law in 1906, he established a legal framework for the protection of national treasures. The law gives presidents the power to designate monuments on federal lands and waters—an authority granted by Congress that has for more than a century protected landscapes of extraordinary cultural, scientific and ecological value. The Antiquities Act has been used more than 150 times by presidents of both parties. Every president since 1906 — with the exception of Presidents Nixon, Reagan and George H.W. Bush — has used the Antiquities Act to protect iconic places. The law has also been used to protect cultural heritage sites — from Stonewall to Birmingham to Cesar Chavez’s family home — that tell the more complete story of our nation. The Congressional Research Service has found that the Antiquities Act does not authorize the President to repeal national monument designations. Only Congress has that authority. Numerous legal scholars have reached the same conclusion.